We have been slackers. No blog postings for a while–and just in case you’re wondering why–we’re back in the writing cave. Our new book, Uptown, is due to our editor on June 1, so our noses are to the grindstone and our twenty fingers to the keyboard. Last year while we were finishing What Doesn’t Kill You, we serialized Exposures, our first novel, on the blog. It was fun and you seemed to enjoy that, but we don't have any more secret novels hanging out in the desk drawer. We’ve been racking our brains trying to figure out what we could do this time around to let you know we still care, we’re still thinking about you and of course want you to keep coming by and seeing what we have going on. Soooo we’ve come up with the “Photo of the Day.” They’ll be random pictures from our lives, present and past, our work environment, stuff we see, people we meet–a little bit of this and a little bit of that. Enjoy and be sure to let us know what you think! First pic below... a new one tomorrow! 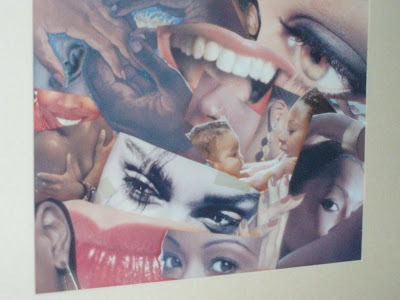 This is a collage we made when we were writing Tryin' to Sleep in the Bed You Made to remind ourselves to always include the 5 senses. Now it's framed and hangs in our office because sometimes we still need reminding! 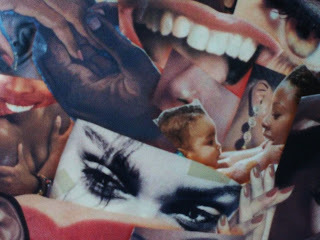 I love this collage. It's really a masterpiece. Very mosaic.